Tickets are $35.00 each which include Room Hire, Lunch & Soft Drinks/Juice & Tea/Coffee, Raffle Ticket and hopefully a Goodie bag! Children Under 5 Free, however, there will not be a goodie bag or raffle ticket for them. Lunch will be Sandwiches, Wraps & Baguettes, Cheese Platter & Fruit Platter, other dietary requirements upon request. Please include the words SYDNEY MEET or Blythe Fest with payment, so I know what it is for. Also, please include your address so that I can send out tickets when they become available. There will be competitions on the day also! We are hoping for trade tables also! Thank-you Angelique!! We are all SO SO excited to meet you all!! It sooo exciting!! Hello. I really want to go to the Blythe meet this year but I was just wondering do u have to go in the comps to win prizes? What is the theme to dress up our blythes this year? Oh, and every person gets a goodie bag with little things in it! Hope I could help! Hi! 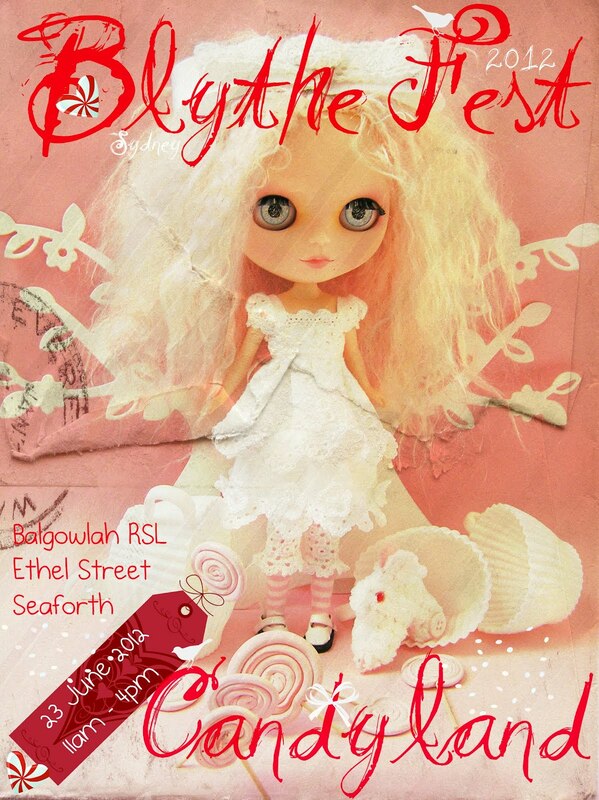 I am so excited to ome to BlytheFest! I just emailed (cos I couldn't work out how to re-activate my blogger account at first!) but want to know how far the venue is from the airport? I am brand new to this forum. I have been looking at Blythes for 3 years but now have "the bug" I cant get enough. I just bought 4 littlest pet shop Blythe and have saved and will buy my first "proper sized" Blythe tonight. Hi there, Is it too late to buy a ticket to attend BlytheFest, just as a visitor. I am a member of WPWD. I hope so. I will be flying from SA, so would need to book flights.